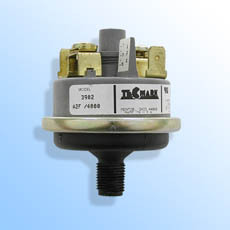 Series 3900 pressure switches are widely used in pilot duty applications and incorporate field adjustable set points and internal switch contacts. 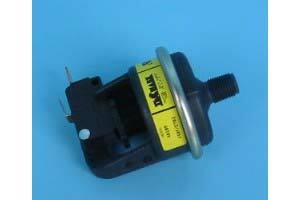 These switches convert a pressure signal to an electrical output. In response to a change in pressure, movement of an elastomeric diaphragm opens or closes an electrical circuit based on a predetermined pressure set point. The Series 3900 feature a compact size and a cost effective, combination terminal design which allows electrical connection with either 1/4" quick connect or #8 screw terminals. Pressure ranges as low as 6" Water Column (W.C.)* up to 5 PSI are available (1.5 kPa to 34.5 kPa). Series 3900 switches assure control stability through wide temperature and humidity conditions. As with all Tecmark® products, Series 3900 switches provide superior performance and uninterrupted service, even under extreme shock and vibration. UL Recognized, CSA certified, as an operating, limit or safety control. Maximum Operating Pressure and Hydrostatic burst pressure, varies based on model configurations. Consult factory for specific application needs. ELECTRICAL Resistive rating: 15 amps @ 6 V.DC. 8 amps @ 12 V.DC. 4 amps @ 24 V.DC.